This entire preamble leads to the two important questions of where to get Ruby and where to get Rails. That's easy. A simple Google search for "ruby rails" is enough to answer both questions simultaneously. I do recommend a single search instead of individual searches, unless, of course, you are also interested in jewelry and traveling by train. 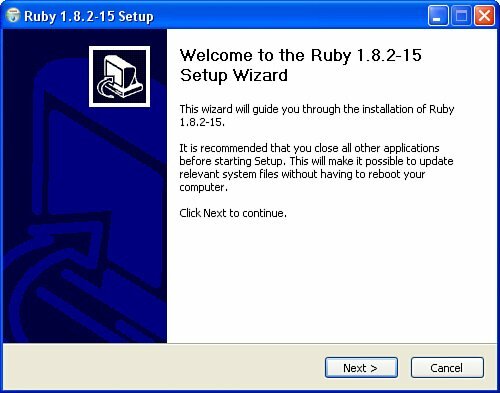 The process of installing Ruby is dependent upon which operating system your machine is running. For wimps like me who happen to be running Windows XP Professional, listening to Jethro Tull, and writing a book, installation is simply a matter of downloading an .exe and double-clicking it to get the ball rolling. It installs just like the shrink-wrapped software that you purchase, minus the autorun CD and price tag, as Figures 13-1 and 13-2 show. If the lack of an autorun CD makes you nervous, then, by all means, create your own autorun CD. However, if the lack of a price tag makes you nervous, I recommend that you buy a second copy of this book and give it to a friend as a gift. In this manner, you've got a bill and you've also given the nice people at Prentice Hall a reason to send me a check. In short, everyone is happy all around. 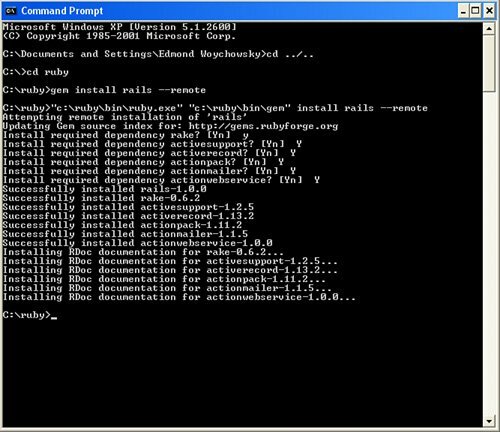 In a Windows environment, the installation of Ruby on Rails requires a couple additional steps. The first of these steps is to install Rails itself. If you have an Internet connection, this is just a single line; it is at the command prompt, but, nevertheless, it is a single line (see Figure 13-3). However, if you are a real web developer and not a quiche-eating Windows user, installation will be a little more complex. Don't worry, it isn't a "Windows is superior" thingin fact, it is more of a "Windows has training wheels" thing. 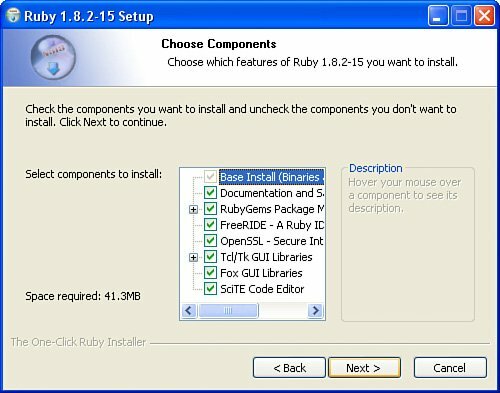 Now that I've thoroughly confused you, the fact is that the RubyGems package manager is part of the Windows installer, which isn't the case with Linux. However, because Linux isn't a stagnant environment, I recommend checking the Ruby website for the latest installation procedures. Now that you've (hopefully), installed Ruby and Rails, it is time to kick the steel wheels (ouch) and take it out for a little spin. Woo-hoo!